"Which Venice transportation pass do I need?" Here's how to pick the right vaporetto pass (if any) for riding public transit in Venice, Italy. ABOVE: An ACTV Line 1 vaporetto cruises under the Ponte dei Scalzi on its way to the Rialto Bridge, the Piazza San Marco, and the Lido. People often ask us whether they should buy Venice transportation passes or city passes. The answer, as with so many things, is "It depends." Venice's public water buses charge outrageous prices for single tickets: The single-ticket tourist fare is a staggering €7,50, which is five times what local residents pay to ride the vaporetto. (It's also several times what you'd pay for a transit ride in most other cities.) By purchasing a transportation pass, you'll begin saving money after you've taken two or three rides per day. At the same time, you may not need to ride water buses regularly during your visit. Venice's historic center is compact, and walking is often the fastest way to get from one point to another. There are times when water buses are necessary: e.g., to visit the Lido di Venezia or the glassmaking island of Murano, to take our self-guided Venice Islands Tour by public transportation, or if you're staying on the island of Giudecca, which is across the Giudecca Canal from Venice's historic center. Finally, no visit to Venice is complete without an evening ride up the Grand Canal on Vaporetto Line 1, so you should factor that into your plans when deciding whether to spend money on a transporation pass. Note: If you're staying on the mainland in Mestre or Marghera, you'll be traveling into the city by train or public bus, depending on your hotel's location. Railroad and bus tickets are extremely cheap compared to vaporetto (waterbus) tickets. "I'm visiting Venice for seven days or less." 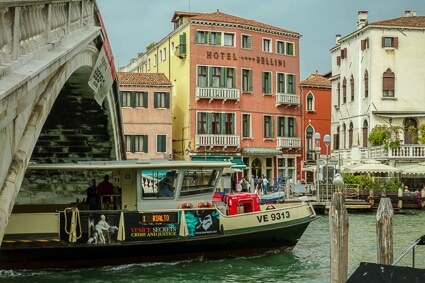 For short stays, ACTV (Venice's transit agency) sells Tourist Travel Cards that allow unlimited travel on public water and land buses for periods of one, two, three, or seven days at a cost of 20 to 60 euros. The longer the period of validity, the lower the cost per day. You can buy Tourist Travel Cards from any ACTV vending machine or ticket booth. Unless you're on a tight budget, we suggest buying a Tourist Travel Card for the duration of your visit. This way, you can hop on and off public water buses whenever you wish, without worrying about the expense. If you're watching your euros carefully, consider buying a shorter-duration pass and bunching your waterbus trips into the period of validity. For example, with a two-day pass, you could tour the islands of the Lagoon and visit the Lido on the same day, followed by a visit to another island location (such as Giudecca) on the next day with an evening boat ride up the Grand Canal. You can buy the Tourist Travel Card as part of a Venezia Unica for Tourists "city pass," which may be worth considering if the city pass has other features that interest you. For slightly more than the basic price, you can buy a Tourist Travel Card with roundtrip transportation into the city from Venice Marco Polo Airport on the No. 5 public "Aerobus." "I'm visiting for longer than seven days" or "I plan to come back in the next few years." If you're staying for a relatively short time (say, two or three weeks), you can simply buy Tourist Travel Cards as you need them. For example, if you're in Venice for two weeks, you might buy a seven-day pass for the first week and a two- or three-day pass toward the end of your trip. For extended stays, or if you expect to return to Venice from time to time, we suggest investing €100 in the Venezia Unica city pass for Frequent Users. This is a plastic stored-value card (personalized with your name and photo) that lets you ride public transportation at cheap residents' rates. A carnet of 10 fares will cost you only €1,40 per ride, compared to €7,50 per ride at the tourist rate. The card is valid for five years, and you can add value whenever you wish--either online or at any ACTV ticket machine. With the Venezia Unica pass for Frequent Users, you'll be entitled to a 50 percent discount on Alilaguna airport boats. You'll also be able to cross the Grand Canal by traghetto at a hefty discount.